Rachmaninov still has his detractors and one might easily imagine admirers of some of the composers which Steven Osborne has so brilliantly championed in his recording career so far – Messiaen, Tippett and Britten, for example – are exactly the doubters who Osborne addresses in his own introduction to this disc. The case he makes on paper – that listeners and performers should relish the music's emotional directness rather than long for more ambiguity onto which to project their own feelings – is eloquent enough; it would count for nothing, however, were it not backed up with such outstandingly vivid performances, argued with clear-sighted musical intelligence and despatched with blistering virtuosity. It's clear from every bar of Osborne's Rachmaninov that he really does love this music. He does not pamper and spoil it, though, but treats it with the same 'clarity and emotional discretion' that he identifies in Rachmaninov's own playing. He is unusually alive to the textural possibilities in the music, too, with the often complex cross-melodies and counterpoint all articulated with astonishing skill. I don't remember, for example, hearing the melody of the big B flat prelude's central section sung with such care, hovering effortlessly above the choppy accompaniments; listen, too, to the way the various lines in the G minor's lyrical middle section are made to intertwine whilst remaining distinct. There could be a danger that such attention lavished on texture and touch (Osborne's pianissimo takes the breath away on several occasions) might make for a lack of power and thrust in the bigger works. Osborne's achievement is the fact that he manages all this subtlety whilst maintaining structural integrity and, when required, conjuring up visceral, head-spinning virtuosity in spades. In fact, it's the inexorable momentum he produces with the pole-axing build-ups in dynamics contrasted with almost impossibly hushed, veiled colours he can call upon which make this disc such a constant pleasure. Without ever giving the impression of calculated effect, Osborne integrates these little instances of brilliance into a cogent and irresistible vision of each individual prelude, as well as across the cycle. It's difficult to pick out favourite moments on this disc but, alongside those already mentioned, the amazing delicacy with which Osborne strokes the off-beat notes high in the register as the D major (op. 23 No.4) prelude slowly winds down must count. Also the beautiful but subtle rubato he employs in the accompaniment of the G major (Op. 32 No.5), spinning the melodic line with rare seductiveness. Although Osborne rattles through the virtuosic numbers with dexterity and power, he is maybe even more impressive in the reflective preludes. An example is the B minor (Op. 32 No. 10) whose gentle initial Siciliana is gauged to the most heart-breaking effect before a patiently executed build-up of extraordinary cumulative effect. Similarly, with the final piece of the Op. 32, Osborne grades his dynamics to perfection, finally unleashing its grand climax with a strength that never spills over into bluster. 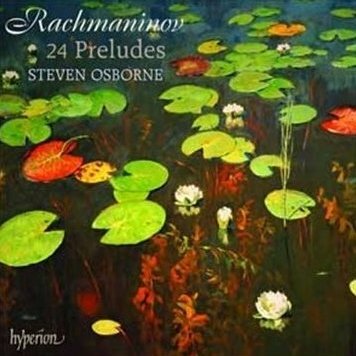 Like Stephen Hough and his recording of Rachmaninov's concertante piano works on Hyperion before him, Osborne's traversal of the Preludes is likely to jump to the top of the list of recommendable accounts. It's already tipped for awards and has received a clutch of exemplary five-star reviews. There's too much excellent, passionate and intelligent pianism on show here to disagree and Osborne makes a persuasive a case as possible to the music's doubters. There are other ways of approaching this music which might emphasise the purely visceral in some of these preludes, or have an even more extravagant romantic sweep to them. I might find myself returning to them still as a guilty pleasure, but it will likely be Osborne's that I reach for most often.